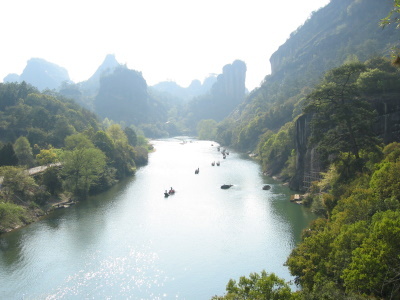 Mount Wuyi, located at Fuijan province, is the most outstanding biodiversity conservation zone of Southeast China. It's the largest and most representative example of Chinese subtropical forests and South Chinese rainforests' biodiversity. The designated area also contains a series of exceptional archaeological sites, including the Han City established in the 1st century BC and a number of temples and study centres associated with the birth of Neo-Confucianism in the 11th century AD. I visited Wuyi Shan in Feb. 2017 on a weekend I had spare, being in Fujian Province on business at the time and this being one of the reachable UNESCO sites from where I was based. The two main activities are floating along the river on a raft (accompanied by what I assume was some sort of running commentary, tea and music) as well as rambling across the mountainous terrain which features many tea plantations - some of which were purportedly slated for imperial use due to their specific geographic location and thus I assume climate / sun / shade / soil / overall quality. There is also a temple and a cave which you will come across, with all the major sights being serviced by regular shuttle-buses. A one-day tour ticket was Y150 at the time. I'm not sure I'd go out of my way to travel here if I weren't already nearby for other reasons, but it did give me a chance to stretch my legs and get some fresh air away from industrial cities and I did want to share a few photos given that there have yet to be any published. 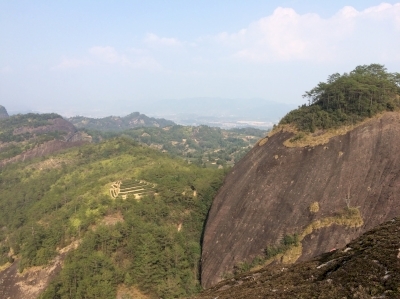 Mt Wuyi is one of the best places to visit if you want to get away from the busy similar places such as Mount Longhu where you get to see the same rock-graves and formations, a trip down the lake on a raft and it comes with an "Impressions Wuyishan" as you might have seen in Lijiang, West Lake or Haikou. Worth a visit for the evening as there is not much else to do after dark aside from eating. There are not many foreign tourists here but busloads of Chinese tourists which means they amass at the bus stations but won't venture too far into the walking area. Let's get started with the mountain. There are 2 areas to visit and the main spots are connected with a free shuttle bus if you bought the entrance ticket which is valid for several entrance gates so you don't have to visit all in one day. You are recommended to take one day for the northern part alone as there is a lot to see and gently hike, and then finish off with the raft trip. The next day should go to the southern area. Doing all in one day is possible but a bit tight especially as you need to time the rafting when you buy the ticket. There are not many steps up and down and the term mountain is misleading in this case. There are many rocks around you and once in a while you will have a small ascend but unless you are really out of shape it is easy. Start by taking the bus to the very north and walk south from there seeing many things on the way. You will see a tea plantation (Wuyishan Tea is famous in case you don't know). At the road you will find a temple that is less interesting but the day is over soon if you walked along. There are a few narrow spaces in the northern area where you have to take off your backpack to get through. Southern area is more for observing than hiking. You have the typical "thread in the sky" they call what are two massive rocks close together where you can just see the light in a tiny line at the ceiling. I don't recommend this but go ahead if you must or if it empty. If there are people queuing it could take a long time to get through and the space is extremely narrow! Even "normal" people might get a bit nervous if the line does not move along. Some areas of this part are fenced off because they are too dangerous to walk nowadays. You can venture quite far south and you won't see many tourists because they all stay near the thread part which I have to admit are the best places to see in this area. The raft trip is very nice and you see the graves in the rocks and many formations that are marked on your map. The only downside is that the local rafters ALWAYS try to squeeze money out of the group. Basically they claim they don't make much money on this job and if each passenger forks out 10 yuan they will sing a song and tell you about area, point out rocks. It's not so bad but his kind of forced guide is useless if you don't understand English plus if the rest of the group wants to pay but you refuse they make you look like the bad guy. They do this at every location in this area like Longhu and it gets very boring. If you don't want to pay just say you have been here before. Spend the evening going to the Impressions show - the only cultural show in town. You don't need to understand anything to enjoy this. The colors, music, images and dancing alone is very impressive - the best Impressions show I have seen (and I've seen most). Dinner is best done at a fast food restaurant - I kid you not. The local food is extremely greasy and extremely overpriced. You will need to detox after the meal so after the first night I chose Decos (KFC ripoff) - for someone who usually avoids all fastfood this was heaven. The hotels are all in the "new" town near the mountain. My hotel was across the bridge in the mountain area which means you could walk there but the bus is still a better option. If you stay in the new town you can take a shuttle bus to the bridge and then exchange the other bus. If you want to go to the airport you can take the bus as well. Taxis will tell you there is no bus but the new town is basically just a long road and as they don't use meters you will get ripped off - generally don't go for taxis if you can speak/read some Chinese and try to find out alternatives. Even taking a taxi from the main road is better than the airport/station itself. The rail station is in the old town which is dirty and has nothing but a market on a wooden bridge which is interesting to walk through if you are going to the rail station at night anyway. You can also choose to eat here for cheaper but I suppose it's also not very good. The new town has 4 things: hotels, overpriced restaurants, carvings (big ones, not souvenirs) and tea shops. The latter is more interesting for us tourists. You can get a small pack for 10 RMB but obviously the quality is crappy. The green tea is really not for everyone and a bad blend is even worse. Either buy something for 50-60 or just forget about it. Finally, when you get to the plantations in the northern area you can eat tea eggs and a bowl of tea. Actually affordable and delicious snack. 57 Community Members have visited.